Scientists say they have made a significant leap towards creating a vaccine that would protect against every form of flu. 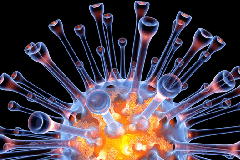 A team at Imperial College London say they have made a "blueprint" for a universal flu vaccine. Their discovery is published in the journal Nature Medicine. Influenza is able to change the proteins that protrude from the surface of the virus as readily as people change outfits. However, the material on the inside is common to many strains of flu. Vaccine researchers believe targeting the core of the virus may be the way to develop a universal vaccine. just get on and do it"
Swine flu was a new virus from a mix of bird and pig flu. The outer shell should have been a completely new experience to the immune system, but the core may have been encountered before in other flu viruses. The team compared levels of one kind of T-cells at the start of the pandemic with symptoms of flu in 342 staff and students at the university. They showed that the higher the levels of the T-cells a patient had, the milder their symptoms were. Researchers then teased out the specific part of the immune system that offered some pandemic flu protection and which part of the virus it was attacking. Prof Ajit Lalvani, who led the study, told the BBC: "It's a blueprint for a vaccine. We know the exact subgroup of the immune system and we've identified the key fragments in the internal core of the virus. These should be included in a vaccine. "In truth, in this case it is about five years [away from a vaccine]. We have the know-how, we know what needs to be in the vaccine and we can just get on and do it." This would be a distinct approach compared with other forms of vaccination, such as the MMR jab. These trigger the immune system to produce antibodies that can attack an invader. The prize could be huge. Seasonal flu kills between 250,000 and 500,000 people each year and new pandemics have the potential to take doctors by surprise and kill large numbers of people. Prof John Oxford, of Queen Mary University of London, said: "This sort of effect can't be that powerful or we'd never have pandemics. It's not going to solve all the problems of influenza, but could add to the range of vaccines. "It's going to be a long journey from this sort of paper to translating it into a vaccine that works." Jenner Institute in Oxford, said: "Live attenuated influenza vaccines which are given by nasal spray and will be used in children in the UK from this autumn are much better at increasing the number of influenza-specific T cells, but these vaccines only work in young children who haven't yet had much exposure to influenza virus, so we need an alternative approach for adults.